At The Red Pines, we provide the perfect atmosphere for a delicious meal with our full menu and daily specials. We also offer carry-outs if you would like to dine at home. Plus, if you really enjoy the outdoors, our heated patio has a perfect view of Lake Onalaska's northern shore with seating year round. We also have an outdoor volleyball court. 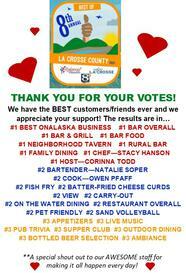 Welcome to Red Pines Bar and Grill - Voted La Crosse County's #1 Fish Fry & #1 Rural Bar located on Lake Onalaska. Nestled on the shores of picturesque Lake Onalaska, the Red Pines Bar & Grill is a destination location. A casual restaurant delivering high quality made from scratch meals, we are known for our cozy, rustic atmosphere, hand-prepared walleye, lake perch, in-house smoked ribs, half pound burgers and brisket as well as our delicious homemade pizzas, soups, sides, dressings and sauces. People come from far and wide for our Shrimp & Fish Fry on Friday nights. We provide the perfect atmosphere for a delicious meal with our full menu, daily specials and fully stocked bar that includes a wide selection of craft beers. Come for live music on Saturday nights and enjoy 2-4-1 Bloody Marys every Saturday and Sunday 11-2. We have a beautiful view with a heated patio providing seating year round as well as a sand volleyball court enjoyed by kids and adults alike. If you are looking for a delicious meal served in a relaxed, "northwoods" environment - a place where you feel right at home when you come in to dine or enjoy drinks with friends, be sure to come to the best place for the best fish fry, hand-battered walleye cheeks and cheese curds, awesome cocktails and craft beer near Onalaska - Red Pines Bar and Grill! Whether you are dining alone or with family and friends, you're sure to enjoy our outstanding selection of food and friendly customer service. Our happy customers come to us for great food, great drinks and great times. They just love the quality of service we provide and the warm feeling of being "at-home" once they walk through our doors. 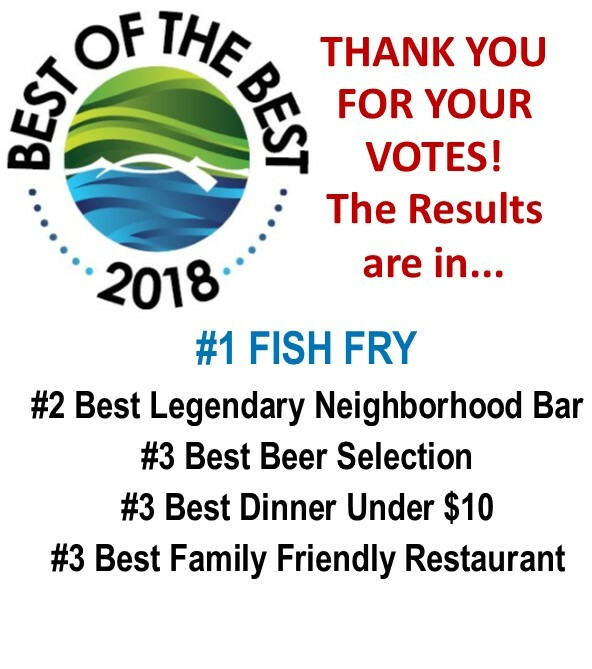 If you're in Holmen, Galesville, La Crosse, West Salem, Bangor, La Crescent, Tomah or Sparta or other surrounding areas and are looking for the best place to get delicious food, great drinks and an overall great experience, Red Pines Bar and Grill is the place to be! Escape to the "Northwoods" of Onalaska – Great Food – Always a Great Time – Red Pines Bar & Grill. The Red Pines was recently featured on Discover Wisconsin. Check it out to learn more!